508MM stringing blocks are normally used for stringing medium size conductor (17-25 mm) in overhead transmission line construction. We have designed series of these stringing blocks for single conductor, 2 bundled conductor and 4 bundled conductors stringing. All the sheaves are mounted on ball bearings. 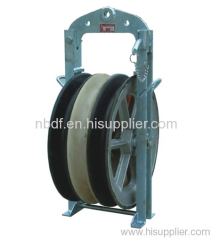 The central sheave is specially designed and manufactured for passing the pilot wire rope. The frame is made of galvanized steel.